Situated in historic Kealakekua ahupua‘a and overlooking the Bay, the 13-acre Amy B. H. Greenwell Ethnobotanical Garden mission “supports Hawaiian cultural traditions of land use and plants, and conserves the plant resources of traditional Hawaiian cultural activities." The Garden contains over 200 native plant species, many of which are rare and endangered. Many kinds of traditional and modern activities and research are being perpetuated here. Set amongst the most intact remnants of the Kona Field System, the Garden includes agricultural, residential and sacred sites. The historic Pa‘ikapahu Heiau is in a parcel near the main Garden. Kealakekua ahupua’a, which is currently being developed with community input by the State of Hawai`i, includes the historic village of Ka‘awaloa and Hikiau Heiau on the coast, and also the site of Capt. James Cook’s death by the Bay. The Garden is a crown jewel with living cultural, ethnobotanical and archaeological significance to Hawai‘i and the Pacific. If Amy Greenwell were alive today, she would be 95 years old. We would rejoice to have her with us here in Kona – an intelligent, attractive and vivacious elderly female. She still might be willing to dance an impromptu hula if the music seemed just right, as it obviously did back in 1960. How appropriate the shutter snapped just as her fingers formed buds of some sweet smelling flower, for flowers were always on Amy's mind. However, if she were still pruning rose bushes at her Captain Cook residence, Bishop Museum's Amy B.H. Greenwell Ethnobotanical Garden would not exist! Amy passed away in 1974 at the age of 54. She died of multiple myeloma, a rare cancer, but one Amy knew well because her own father, Arthur Leonard Greenwell, died from it in 1951. Kona's beloved Hawaiian garden is Amy's baby, conceived in her heart and soul when she realized she was going to die before her time. Her paternal grandfather was Henry Nicholas Greenwell, a pioneering Englishman who arrived in the Sandwich Islands in 1850 and put down roots at Kalukalu, Kona Historical Society's present headquarters. He cultivated an orange grove, planted fields of corn and pumpkins, and promoted Kona's coffee crop. He established a far flung ranching enterprise based on wool from sheep and beef and butter from cattle. His wife Elizabeth never spent a dull moment, occupied from dawn to dusk with their ten children and running her husband's general merchandise store. Among Henry's many land purchases, that of the ahupua’a of Kealakekua in 1881 from missionary son John D. Paris, Jr., was his largest. Second son Arthur inherited Kealakekua after his father’s death in 1891. In 1912, Arthur, at the age of 40, married Miss Beatrice Hunt Holdsworth of Honolulu. They honeymooned in Europe. Mrs. Arthur Greenwell was extremely stylish with very striking dark good looks. Although she had married a Kona rancher, she was determined to raise her children in Honolulu. Arthur built her a home on `Uala ka`a Street (Rolling sweet potato Street) near Punahou School on O`ahu, but during the summers and school holidays, the family hopped on board the inter-island steamer Humu`ula to gather at their Kona residence built above Kealakekua Bay. Miss Amy B.H. Greenwell, authority on matters Hawaiian, collaborated first efficiently at the New York Botanical Garden and later at the Bishop Museum in producing this volume. Her very active co-authorship, recorded for each pertinent sheet with her signature, unfortunately ended upon her removal of residence from Honolulu, Island of Oahu, to Capt. Cook, Island of Hawaii. Indeed. Amy left Honolulu in the mid-1950s, returned to Kona and built a small home above Mamalahoa Highway in the ahupua`a of Kealakekua, surrounded by good friends and family, pugs and plants. Her love of archaeology took her places a young single woman rarely ventured. In 1953, she hiked to Mauna Kea's Adze Quarry, long before any road existed to reach that 12,000 foot lofty cave, and spent the night there in the company of friendly physicians. While camping near Ka Lae, a necessary bathroom break to escape the company of male archaeologists from Bishop Museum resulted in discovery of a major cache of early Hawaiian fish hooks buried in the sand. Unafraid of adventure, Amy fearlessly clambered into innumerable lava tubes, sponges sewn onto the knees of her trousers to protect her shins from jagged `a`a. Her fascination with unusual native plants kept her busy in amongst her garden's historic stone walls, snipping cuttings and harvesting seeds she willingly shared with one and all. Amy never married. Her older brother Sherwood lived nearby with his wife and family and their sibling relationship remained close and affectionate. 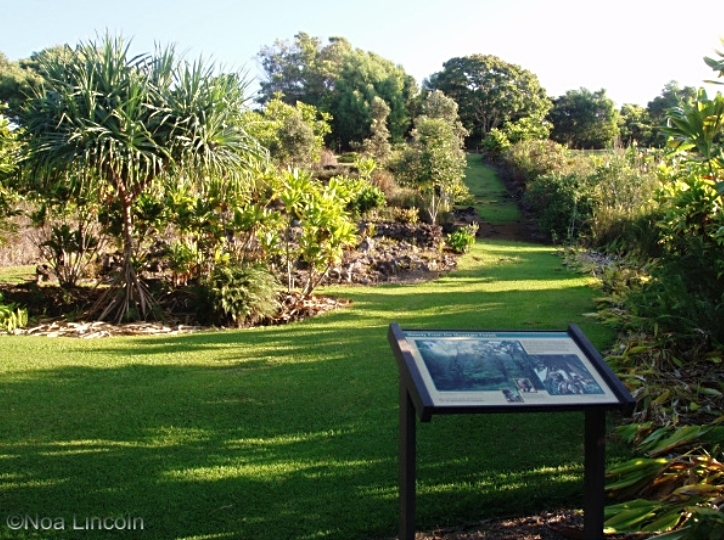 Her decision to leave her home and some adjoining property to Bishop Museum after her death to create a Hawaiian ethnobotanical garden was arranged with Sherwood’s promise of assistance. Encouragement for this inspired legacy came from Bishop Museum's own Dr. Kenneth Emory who visited Amy daily at Queen's Hospital in Honolulu as her illness worsened, never without a sweet smelling lei of pua kenikeni in his hands. An amateur scientist to the end, Amy left her body to the University of Hawaii for research purposes. After her death, her family placed a bronze plaque inscribed with her name within a fenced enclosure protecting a grove of native trees high on the slopes of Mauna Loa, a fitting tribute to her memory. Thanks to the work of many fine botanists and innumerable helping hands, both paid and volunteer, Amy’s dream flourished. Her bequest grew to become a recognized Kona landmark, a living cultural treasure, and an invaluable resource for the entire state. Amy’s garden is planted in exactly the right place; a cornerstone of Kamehameha's agricultural kingdom in the historic ahupua`a of Kealakekua. The plants are flourishing, their roots firmly anchored in Kona soil tilled by generations of Kona families. The baby has grown up to be a fine reflection of its mother – generous, smiling and beautiful.